Wee You-Things Blocks are Bright, Modern, and Textured! Okay, we know you’ve seen enough sets of cool eco-friendly blocks to fill an entire nursery, but we love how Wee Society combines bright colors, artisanal craftsmanship, and a sense of humor to create the funkiest blocks around. 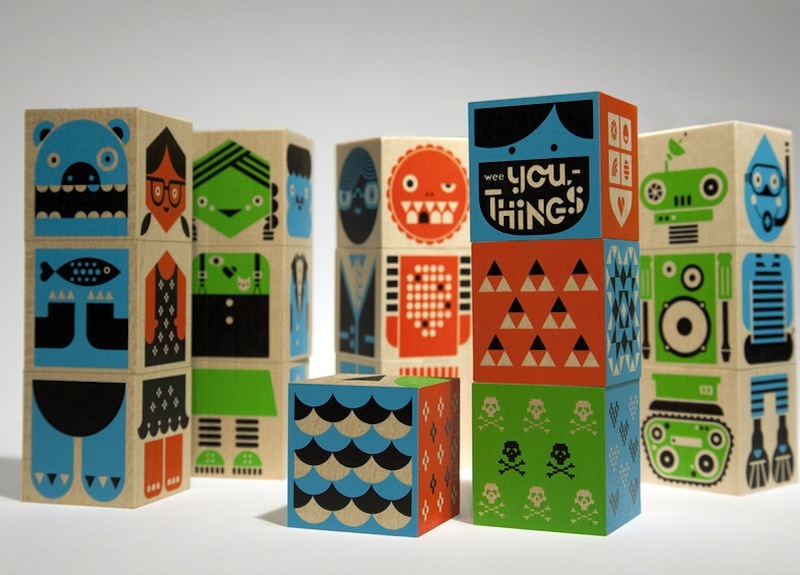 Wee You-Things come in a set of 16 Michigan-grown basswood blocks, which are printed with non-toxic, lead-free inks. One characteristic that sets these blocks apart from the others is their cool texture. The blocks feature debossed patterns such as triangles or flowers, which make them extra fun for little fingers to hold. The acid colors depict pirates, cowboys, and three-eyed mustached men, all with a tongue-in-cheek design that gives new meaning to the term “modern classic.” The set provides tons of mix-and-match fun, lots of stacking potential, and three different puzzles for your child to master, which means this block set can be used by big and little kiddos alike. The blocks also come with a storage tray — we’d almost call it a display tray since Wee You-Things are like funky, cheerful works of art! Okay, we know you�ve seen enough sets of cool eco-friendly blocks to fill an entire nursery, but we love how Wee Society combines bright colors, artisanal craftsmanship, and a sense of humor to create the funkiest blocks around. Wee You-Things come in a set of 16 Michigan-grown basswood blocks, which are printed with non-toxic, lead-free inks. One characteristic that sets these blocks apart from the others is their cool texture. The blocks feature debossed patterns such as triangles or flowers, which make them extra fun for little fingers to hold. The acid colors depict pirates, cowboys, and three-eyed mustached men, all with a tongue-in-cheek design that gives new meaning to the term "modern classic." The set provides tons of mix-and-match fun, lots of stacking potential, and three different puzzles for your child to master, which means this block set can be used by big and little kiddos alike. The blocks also come with a storage tray -- we'd almost call it a display tray since Wee You-Things are like funky, cheerful works of art!